If you are into following events involving sol, our system's central star, you may have heard of a major event in progress right now, but chances are you haven't heard as the Western media is strangely silent about the event. NASA has issued a communication about the event that plays down the importance of what is happening. Apart from an Item in Astronomy and Space News, the story was picked up - as far as I can tell - so far only by a paper in Brisbane, Australia. But a more detailed account comes from Russia. The paper Commersant puts the event in perspective saying that the flare was classified an X-9, meaning an extremely powerful event. Except for its timing which directed the energy away from earth, the flare could have disruptive effects on both electronic communications and health. But we seem to be too preoccupied with the politics of man-made global warming to pay much heed to energetic phenomena that easily dwarf anything our technology could bring to bear. Or are we being purposely being kept in the dark? The largest electromagnetic energy emission in the last 30 years has been recorded on the Sun, the Shternberg State Astronomy Institute said on Thursday. This energy outburst may damage equipment of space satellites, the scientists say. Doctors warn that the emission is dangerous for those afflicted with cardiovascular illnesses as well as for healthy people. 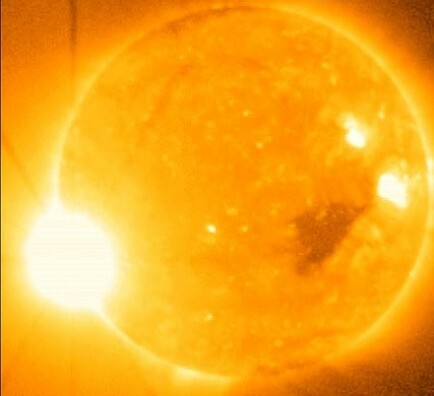 Scientists at the Shternberg Astronomy Institute of the Moscow State University have reported record-high emissions of electromagnetic energy on the Sun, the biggest since the 1970s. Over the past few days, the volume of sun radiation, or X9, has exceeded the normal level 1,000-fold. The scientists call this phenomenon an anomaly and say that the Sun is now in a stage when sunspots, sources of high electromagnetic radiation, are unusual. "Outbursts on the Sun like this have been extremely infrequent over the past 30 years," said Igor Nikulin of the Shternberg Institute. "What is more, we have never had a chance to observe such emissions with the sun at its minimal activity." A major X-9 flare erupted last week. It emanated from a large sunspot, numbered 929, which is just coming into view around the eastern limb of the Sun. The flare lifted off the Sun and was directed away from Earth. But this sunspot will rotate toward the centre of the Sun over the next few days and could offer up more major blasts that could take direct aim at our planet, forecasters say. It may cause auroras in Tasmania later this week. Flares of this magnitude (X-class flares are all major) can damage satellites and disrupt telecommunications on Earth. They can also threaten astronauts in space. NASA sometimes orders astronauts aboard the International Space Station to retreat to the most well protected part of the orbiting outpost to avoid excess radiation exposure. Spacewalks are avoided during solar storms. Sunspots are dark regions of the Sun where intense magnetic activity caps the upwelling of material from below. Sometimes a cap blows, and a visible flare results. The flares are loaded with X-rays and other radiation, all of which reaches Earth moments after the eruption and can be accompanied by a shower of protons. These storms can arrive in moments with little warning and can be deadly. Many flares are accompanied by clouds of electrified gas called coronal mass ejections, which can slam Earth a day or so later. Earth is somewhat shielded from solar storms, but some of the radiation leaks through our protective magnetic field. Experts say space radiation is one of the biggest threats to current and future space missions, including the effort to establish a lunar base. Scientists say that the first indications of increased solar activity were recorded on Monday when four sunspots appeared on the eastern part of the visible side of the solar disk. First, the scientists observed flashes on the Sun which were classified as moderate. However, the flashes were followed on Tuesday by massive outbursts of electromagnetic energy. "Such a large cloud of hot plasma has been released into space that even electronic equipment on space satellites may be damaged," Vladimir Matveev at the Moscow Aviation Institute says. The Sun's electromagnetic anomaly has not reached the Earth yet. However, the Earth is expected to reach the sunspots quite soon. The encounter may happen this weekend, scientists at the Shternberg Astronomy Institute report. Igor Nikulin says: "If the area of the sunspots does not diminish in three or four days and the emissions continue, it may have a serious influence on the magnetic field of the Earth." A cloud of hot plasma from the sunspots will make the Earth's magnetic field vibrate and will cause a powerful magnetic storm." Doctors recommend their patients to keep to a special regime during the magnetic storm. People with cardiovascular illness are believed to be at a particular risk. However, quite healthy people should be on their guard as well. "One should not go overboard with drinking, going to the sauna or doing extra work," Vladimir Ryabinin, chief physician at the Sklifosovskiy Ambulance Institute, advises. Other doctors suggest that people pay close attention to their health conditions during the days of the magnetic storm and go to consult their doctors in case of any problem. A solar tsunami has been caught in the act of rolling across the face of the sun. The unusual shock wave, clocked at about 700,000 miles per hour, was triggered by a huge Dec. 6 flare that erupted from a rowdy Earth-sized sunspot during what is otherwise a relatively quiet time for the sun. "This is clearly a unique event," said Alexei Pevtsov, a solar physicist at NASA headquarters. "I don't think we've ever seen a wave of that magnitude." "These large scale 'blast' waves occur infrequently, but are very powerful. They quickly propagate in a matter of minutes covering the whole Sun, sweeping away filamentary material," said Dr. K. S. Balasubramaniam, of the National Solar Observatory (NSO) in Sunspot, NM, who is studying these and other phenomena. "It is unusual to see such powerful waves encompassing the whole sun from ground based observatories. Its significance comes from the fact that these waves are occurring near solar minimum, when intense activity is yet to pick up." The gigantic solar wave at 400 km/s across the sun's face is the effect of the solar space vortex enclosing the sun and turning it axially. Please see the attachment. Believe me, future generations will be amused with the modern relativistic-quantumized-empty space philosphy of physics. Space weather forecasters revised their predictions for storminess after a major flare erupted on the Sun overnight threatening damage to communication systems and power grids while offering up the wonder of Northern Lights. "We're looking for very strong, severe geomagnetic storming" to begin probably around mid-day Thursday, Joe Kunches, Lead Forecaster at the NOAA Space Environment Center, told SPACE.com this afternoon. We are at a dead solar minimum in March 2007. Not much of a minimum, if we see what happened only a few months ago. But - so says NASA - the next solar maximum, which will be most intense between 2010 and 2012 has all chances of being a big one. So we have a solar storm warning. See this NASA article why they think it will be intense in the next few years. GPS receivers have become widely used in recent years, using satellite signals in navigating airplanes, ships and automobiles, and in using cellphones, mining, surveying and many other commercial uses. Indeed, banks use the system to synchronize money transfers, "so space weather can affect all of us, right down to our wallet," said Anthea J. Coster, an atmospheric scientist at the Haystack Observatory of the Massachusetts Institute of Technology. The cause for their concern, Johnson said, was an unexpected solar radio burst on Dec. 6 that affected virtually every GPS receiver on the lighted half of Earth. Some receivers had a reduction in accuracy while others completely lost the ability to determine position, he said. Did you get lost while out driving in December? If you did, blame the solar flare that zapped signals sent out by the GPS satellite network to keep travellers travelling in the right direction. According to researchers at New York's Cornell University, two major solar flares observed on 5 and 6 December emitted blasts of radio noise that were ten times more intense than than the worst burst then on record, Reuters reports. A new movie from the Japanese Hinode spacecraft is one of the most detailed glimpses of a solar flare ever made and has helped scientists see what's behind the colossal eruption. The striking video, released this week, shows a major flare that lifted off the Sun Dec. 13, 2006. The flare erupted from a sunspot catalogued as number 930. The next 11-year cycle of solar storms will most likely start next March and peak in late 2011 or mid-2012--up to a year later than expected--according to a forecast issued by the NOAA Space Environment Center in coordination with an international panel of solar experts. The NOAA Space Environment Center led the prediction panel and issued the forecast at its annual Space Weather Workshop in Boulder, Colo. Expected to start last fall, the delayed onset of Solar Cycle 24 stymied the panel and left them evenly split on whether a weak or strong period of solar storms lies ahead, but neither group predicts a record-breaker. The sun has been relatively quiet for many months. Now, a modest knot of magnetism, which appeared Dec. 11, might signal the long upward trend in activity. "This patch of magnetism could be a sign of the next solar cycle," said solar physicist David Hathaway of the Marshall Space Flight Center. "Solar minimum is upon us." Though forecasts vary wildly, some scientists predict Solar Cycle 24 will be intense. If so, "it could have significant impacts on telecommunications, air traffic, power grids and GPS systems," according to the NASA statement. The peak is expected in 2011 or 2012. Regarding the SOHO "CCD Bakeout"..
"All the good stuff is classified"
Life could be such an exciting ride if we just were having a society that's a bit more transparent... like no state secrets. I don't where you hide out, but I knew about this from American side. Its not a big story because it doesn't mean a lot. Had it been facing the earth I am sure the news would have better covered it. Why don't you pay attention to the ACE site instead of Soho. I searched and didn't find anything in the American media. Perhaps you would like to point me to where you got the news? "The flares are loaded with X-rays and other radiation, all of which reaches Earth moments after the eruption and can be accompanied by a shower of protons." Moments to reach Earth? If I remember correctly, these particles still have to abide by the laws of physics and thus it would takes at least 8 minutes (that's how long light takes to reach the Earth) and since many of these mass coronal ejections are sub-light, many will take considerably longer to reach us. Too many of you have no scientific training at all and take newspapers and other rags to heart without looking critically at the actual data. The coronal ejection isn't even going to hit near the Earth but rather off to the side. It may hit our magnetosphere but not the Earth itself. And the medical issues? If you have a heart pacemaker, yes the magnetic storm MIGHT cause a de-fibrillation event if the pacemaker is damaged but otherwise it's a magnetic storm and radiation exposure is limited to persons working in the upper atmosphere like pilots and astronauts. THINK CRITICALLY AND ACTUALLY CHECK YOUR FACTS BEFORE YOU SPOUT OFF ON SOMETHING YOU REALLY DON'T KNOW MUCH ABOUT!!!!! Can the flare blind satelites in preparation for an attack,invasion or war? Like maybe against Iran? The story is bogus right off, since how can this X9 flare beat an X28 in 2003? Heres the story of the record so far. "The November 4, 2003 flare was the most powerful ever recorded. X-rays from the flare overwhelmed the detectors on the National Oceanic and Atmospheric Administration's GOES-12 satellite, so scientists had to estimate how strong it was. They settled on a preliminary X28 rating, equivalent to billions of one-megaton nuclear bombs." In reference to the link of "Most Powerful Magnetic Storm In 30 Yrs Near Earth"
( http://www.kommersant.com/p728532/r_530/Sun_Magnetic_Storm/) posted on rense.com (http://www.rense.com/ ), may I please direct your attention to the following reference: -- The Killshot (http://www.thekillshot.com/) which is an RV forecast of a series of powerful, deadly solar flares which will be impacting the Earth in the near future! In the presentation, Killshot precursor events and the initial solar flashpoints are placed on a timeline. Also, areas of the Earth that will be most affected are pointed out, and potential safe havens described. All of us like to believe that an event such as Killshot would never happen - especially in our own lifetime. And yet…humankind has no control over our star, the Sun. I have no financial interest in the website or the material that it promotes, however I found this info to be compelling and may be useful to your readers. Just to straigthen out some misunderstandings....The x-rays which travel the speed of light, yes take at least '8' minutes to get to earth...so we can say momentarily, and although(in short) our atmosphere and magentoshphere blocks out a good portion of this radiation , some still penetrates. And those sensitive enought are very much aware of its influence on themselves. The next is the actual coronal material that is ejected from the flare. This varies in time that it takes to arrive to earth...depends upon the nature of the flare...we had one a few years ago that suprised scientists because it took only a matter of hours(not sure, but an am sure it was less than a day)...but generally it is safe to say it takes a couple days for such ejections to reach the earth. And when these ejections reach the earth it doesn't effect us directly. These ejections charged up our atmosphere and it is this charged up atmosphere that emits energetic radiation itself. Also, depending upon the polarity of our magnetosphere at the time it arrives determines the strength of our charged atmosphere. November 4th flare was the most powerfull ever recorded but that was only a gauge of intensity not quantity. The flare/s last week remained in a flaring state for a long time and although not peaking as high as previouse records did pour out the most energy in total since the last 30 years. "What bugs me is the nonsensical science purported by newspapers..."
David Hathaway, a researcher at NASA's Marshall Space Flight Center who predicts a strong sunspot cycle, said the biggest hurdle is trying to forecast how the sun will act with little data to work with. "It's like listening to a freight train in the distance to estimate the size of the train," Hathaway said. This was all over the Japanese papers, but trying to find English news on it was a fool's errand. You don't need to be informed via scientists or the media re this event Sepp, The SOHO and Lasco sattelite feeds are open to public view although delayed by a few hours at most. A peek every day is all it takes to be informed. You would be suprised at what pops up in these images on a regular basis and that does not get ANY media attention. I was the actual "X-Files" at KSC. A reeeeealy big X-Class CME just happened, aimed right at us, which has fried ACE...the good news is, SOHO is back online. spaceweather.com has published warnings concerning communications disruptions, but the astronauts are in no danger, of course...sure! I'm gonna stay out of direct sunlight today, as much as possible, and, if I were you kiddies, I wouldn't take a flight today. Perhaps one of the quickest and easiest ways to monitor Solar Flare activity after an alert is to use a communications grade receiver. A quick investigation today is evident we are being influenced by solar driven particles affecting the Earth's Ionosphere. Absorption of all HF signals is quite high as of this posting. The American press is criminally negligent. When the sun let off its largest flare in recorded history, X-45 on November 4, 2003 I first learned about it on the Comedy Channel's Daily show. The exact size wasn't reported in the scientific press till much later. On 11/20/2006 it let off a huge flare with enormous light, but low X-ray radiation, so it was only rated B5. Then on 12/5/2006 it let off an X-9 followed a day later with an X-6. These shut down several of NASA's satellites, cutting off images for study to the rest of us. It was almost funny that their expensive taxpayer funded sensors missed the event while a guy with a special lens on his backyard, tripod mounted telescope got this historical series of images. I mention what comes to my attention on my energy page, although I know I miss a lot. NASA's space weather site is so enormous and saturated with miniscule data it is difficult to see the forest for the trees. A friend worked on the Chandra space satellite and told me the "lens cap" got slammed shut just in time to protect its super sensitive instrumentation. No word yet if it suffered any specific damage. I am most concerned myself with compiled research from several scientists that show an approximate 10 day delay from major X class flares to major quakes. But the incoming energy is difficult to predict - whether it will display itself in an earthquake or severe weather. We seem to get both somewhere on the planet. So I wonder what to expect about December 15 to 17? And an eye-opener for the theologically inclined, look at Isaiah 30:26. That is ominous enough until you look at the verse just before it. Maybe we're all in trouble. According to most accepted points of view, the activity of the Sun is characterized by development spirit bound with either of two processes: “vortex” hydrodynamic processes, which in the total give in an appearance (I figure) “ cold fusion ” of unstable heavy nucleuses of chemical elements, and then - decay of these elements with eduction of radiation and particle flux … the latter is of reduced appearances and is the factor of maintaining of human vital activity. On the other hand, the Mayan calendar predicts loss by our year 2012, and Nostradamus has predicted before it a relative erasure of the peoples in 2008, if they "will not come to a consensus" in 2007. It would be possible to consider all this as nonsense contradicting the paradigm of determinism and impossibility to foresee the future (all of us ARE OBLIGED so to think, if we trust in science), if not faultless Kozirev's experiments show a key opportunity to see "future" of material objects. Thus, in my modest judgement, acquisition of boundless knowledge and the assimilation of other worlds depends only on our ability "to agree" with each other. Differently we shall perish all. And very speedily at that. on Dec 14 and was in hospital with it on Christmas day. Now she is going to have to have a pace maker put in. I am sensitive to Earthquake, volcano,storm and solar activites. I pick up the electromagnetic pulses. I hear the tones of rocks singing seismically during high solar too. My thought was, that this X-9 was way smaller than the X-28+, so how could this be called an event larger in the last 30 years? "November 4th flare was the most powerfull ever recorded but that was only a gauge of intensity not quantity. The flare/s last week remained in a flaring state for a long time and although not peaking as high as previouse records did pour out the most energy in total since the last 30 years." Thank you Sepp. I read that comment, but needed more clarification. I guess. Mind if I qwuote this on my website? it did feel more powerful. you're welcome to quote from here, no problem. I hope some other readers have more to say on your questions. From this event of solar erruptions many effects on the sun's surface are explainable. Any matter of solar flares ejected from the sun's interiors will be deflected by a spatial field (velocity field due to space vortex around the sun) circulating at a maximum speed of about 436.7 km/s in the equatorial plane of the sun in the direction of sun's rotation. Thus, solar flare matter will spiral around the sun and be kept contained within the solar atmospheric belt due to inward acceleration field in the solar vortex, 274 m/s^2 (surface gravity) and will not reach the planets. Gamma rays and magnetic effects will be transmitted at velocity of light and reach the ionospheric/ atmospheric belt around the earth. As an example, a space craft entering the atmosperic belt of the earth in a westward direction will be blasted by a 7.8 km/s spatial velocity field because such a field circulates around the earth due to its own space vortex effect. Space craft should enter the atmosphere eastward only. As a rule, all cosmic bodies with axial rotation have a spatial velocity field due to their respective space vortices that shield exterior matter to fall on their surfaces. Further only axially rotating planets and stars can retain their gaseous atmosphere because of inward spatial field on their surfaces. The cause of solar eruptions is due continuous creation of matter at the sun's center that is pushed out occasionally and perhaps only accidentally tied with 11year cycle.